Holiday Inn Express Los Angeles-LAX Airport is conveniently located for tourists keen on discovering attractions in Los Angeles in a relaxed environment. Located off I-405 on Airport Blvd, this hotel is the perfect getaway for business travellers owing to its proximity to an array of businesses and tourist sites in LA. In addition to this, the hotel is just about 4 kilometers from the Los Angeles International Airport. This makes it the perfect location for anyone making a stopover or arrival at the airport. Look out for the hotel’s address too should the need arise: 8620 Airport Blvd, Los Angeles, California 90045, USA. Holiday Inn Express LA is close to notable attractions that make staying in the city both fun and relaxed. Artsy lovers will be stunned by the creative arts at the Getty Centre on the hill. Entertainment lovers on the other hand, will be lucky to attend a host of concerts at the famed Hollywood Bowl, certainly the perfect place to watch one’s favorite stars live. Nature lovers will be enthralled by scenic destinations. The Santa Monica Pier and Beach is the ideal sightseeing destination, while the LA Original Farmers Market is the go-to location for visitors who would like to interact with the locals. Home to some of the most famous fossils, La Bea Tar Pits LA offers an insightful glimpse into the area’s history. Other attractions worth checking out include Grauman’s Chines Theatre, Venice Beach as well as The Grove Shopping and Entertainment Complex. Back at the Holiday Inn Express Los Angeles-LAX Airport, guests get to enjoy top notch facilities. The breakfast bar serves scrumptious breakfast, after which guests can sweat it out at the fully equipped fitness centre. The heated outdoor pool is perfect for relaxing the afternoon away. Business travellers need not fret as there is a 24-hour business centre in addition to the meeting room that caters up to 40 guests. Ample parking is available, and is complimented by airport shuttle services. Holiday Inn Express LA takes great pride in working to be one of LA’s finest hotels. Its proximity to the airport, coupled with free airport shuttle services makes this a choice getaway. Please note that for airport shuttle services, guests are required to contact the hotel using details provided at the baggage claim area. The hotel has modern rooms that offer adequate working space complete with ergonomic furniture. Free Wi-Fi services allow guests to conduct business even while away. Entertainment options range from cable TV to In-room movie options and the availability of a coffee maker serves to make one’s stay as comfortable as possible. Suites available are ideal for families, while the wheelchair accessible rooms are designed to cater for the physically challenged. The Holiday Inn Express Los Angeles-LAX Airport is an exquisite 3-star hotel that offers visitors compelling reasons to explore LA’s charm while enjoying unparalleled services. 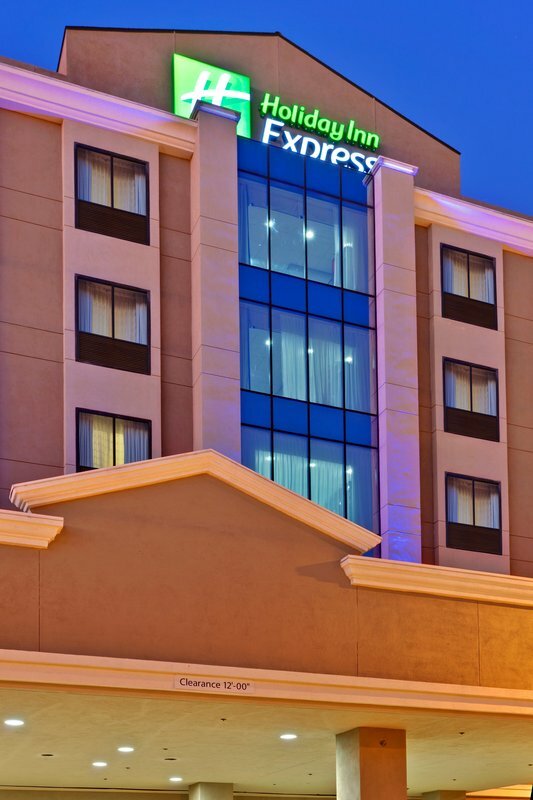 So, whether you would like to go shopping, or link with diverse businesses in the city, or simply enjoy a romantic getaway, Holiday Inn Express LA is the place to be.